Who checks for lumps? Do people know how to check for lumps? Well if not there are many tips on how to do it. Here is how to check yourself from Breast Cancer Care but Breast Cancer Now and Macmillan and other charities have information on their websites about this. And if you are going to have a mammogram there is a site called WoMMeN – Word of Mouth Mammography e Network which will help you to answer questions about mammograms and also has trained mammographers on the site who will answer questions. 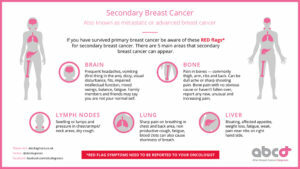 If you have been diagnosed with breast cancer, I have a wealth of information on my website www.abcdiagnosis.co.uk so don’t forget to check this out. All the major charities are signposted on here and lots of useful information about health and well being, my retreats for BC patients, blogs, links, resources etc. And remember primary breast cancer can is curable for around 2/3 of people with early stage cancer will NEVER develop secondary (metastatic or stage 4) breast cancer. Recently someone emailed me say they wish they had known about my site when they were diagnosed so please share this valuable resource! After primary cancer some subtypes of breast cancer can recur up to 20 years later. So for those already diagnosed with primary breast cancer remember to ASK your Oncologist what your risk is? They should be able to tell you if you are unaware. Because of this risk I created an infographic which I share with my followers. It provides the “red flag symptoms” of secondary breast cancer that many patients don’t know about. Lastly Research is very important for any disease. Breast Cancer Now are the biggest UK charity who provide research for breast cancer – if you are going to support anything on Breast Cancer Awareness Month then I’d suggest give to research – it’s what will find better treatments, drugs etc and hopefully (one day) a cure. So now you are aware about all these things, please share this information.